If you encounter issues with running Suitest with Microsoft Edge it may be that your version of Microsoft Edge is outdated. You should enable Windows Updates to ensure that your browser remains at the newest version. In .suitest folder, navigate to resources. Delete the contents of the resources folder. Restart SuitestDrive and try to add the device again. Due to the specifics of a security protocol on Mac SuitestDrive cannot update itself when it has been launched from the default Downloads folder. 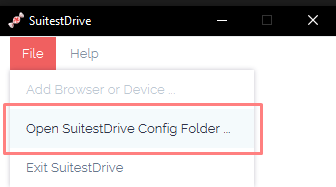 Please move SuitestDrive to any other folder (like your Desktop or Applications folder) to benefit from automatic updates.